The Hills Really Are Alive with the Sound of Music. Yeah, the Hills in Salzburg are definitely alive with the Sound of Music. That may or may not have something to do with the fact that I rode a bicycle about a million miles through Salzburg singing all the songs from that beloved movie. Purple rain jacket and purple bike! Like I planned it. For those who don’t know, Salzburg, Austria, is the location of the Sound of Music. Being a BIG Sound of Music fan, when my friend was visiting, we knew that taking Freulein Maria’s Bicycle Tour of Salzburg was a must. View of Salzburg and the fort from the bridge. What we didn’t know was that Salzburg is the 7th or 9th rainiest city in THE WORLD. It rained for all five hours that we were on our bikes. Once we stopped biking, it stopped raining. The children march past this horse facade in the movie. The tour takes you to film locations from the movie, and includes funny anecdotes about the filming. The cloister gardens where the family hides from the Nazis. The church refused to let the movie makers actually film the crypts, so an exact replica was built in Hollywood where the scene was filmed (you know, were the family are hiding behind the tomb stones and Rolph comes with the flashlight/whistle). These are the caged crypts where the Von Trapp family awaited their fate (which are inside the cloister gardens). The abbey gate. But really: How do you solve a problem like Maria? The Von Trapp House!!!! Complete with duckies! After five hours on a bike, in the rain, we were quite cold and hungry. So we set out to have a hot delicious lunch. I had the gulash, which comes with a friend egg and a giant bread dumpling. Despite the hours of freezing cold, the tour was pretty awesome. I highly recommend it. Though, you should bring a poncho! This will warm you right up. So long! Farewell! Aufwiedersehn! Good night! Posted in Austria, Travel and tagged Austria, Movies, Salzburg, Sound of Music, Travel, vacation. Bookmark the permalink. I’m in Europe – on a quasi vacay. So my blogging has been put the wayside. Forgive me. 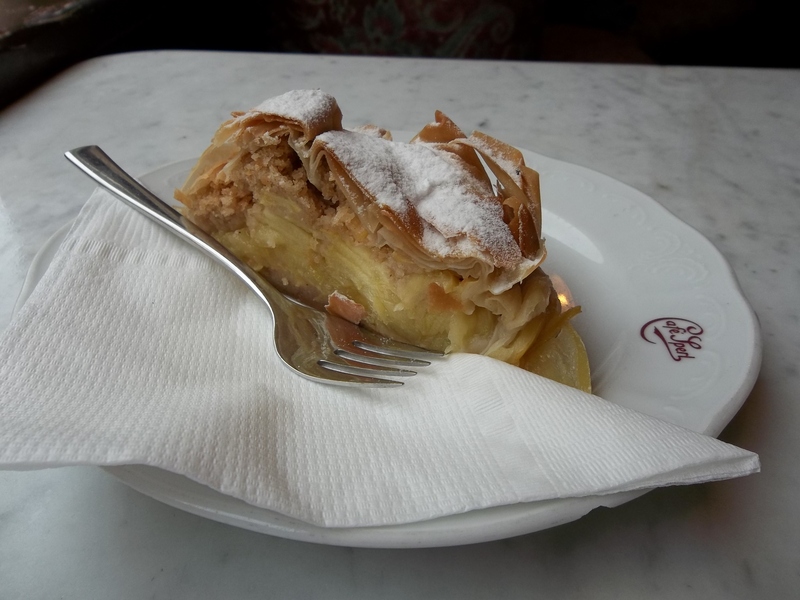 Here is a smattering of Viennese things that I have been enjoying. I am too tired from a day of sightseeing to write a funny story about it, so why don’t you just pretend I’ve written something hilarious and chuckle out loud to yourself on occasion? Great. Thanks! Sacher Torte: A intensely rich, dense chocolate cake, covered with a layer of chocolate ganache, and with a middle layer of apricot jam. Served with an espresso and a bit of schlagobers (whipped cream), this cake is not to be missed. Austrian Gulasch: Unlike Hungarian Gulasch which is a mixture of meat and hearty vegetables, Austrian Gulasch is a thick stew of just beef. Then they add this massive bread dumpling (yum) and a fried egg (in case you hadn’t gotten enough protein from the whole cow served up in a bowl of yummy gravy). Solid, though I might prefer the Hungarian dish to the Austrian preparation. After a cold day though, this really hit the spot. The gardens at Schonbrunn Palace will blow your freaking mind. Aside from being gorgeous, entrance to the gardens is free. This is where I am training for my upcoming half-marathon because the grounds are extensive, and great for running because everything is covered in tiny pebbles, not cement. More of Schonbrunn gardens. That is the “little gazebo” built out behind the palace. And it’s own reflecting pond. Running here totally beats running on a treadmill (or running pretty much anywhere else in the world, for that matter). Pelicans at Schonbrunn Zoo. Yep, that’s right – the oldest zoo in Europe – possibly the WORLD! This zoo is on the pricey side (15Euro) but sooooo worth it. Bring a sack lunch and spend the whole day. That is a sealion, jumping completely out of the water to grab a fish from the zookeeper’s hand. Also at Schonbrunn Zoo. The show was incredible. Posted in Austria, Cake, Dessert, Food, Vienna and tagged Austria, Dessert, Food, Sacher Torte, Schonbrunn, Vienna, Zoo. Bookmark the permalink. It’s about time… for SCHNITZEL!!! I have been in Vienna for over a month now, and somehow I have not written anything about schnitzel?!? How did that happen??!? Schnitzel is probably the most famous food to come from Austria, next to apple strudel (since, you know, both of them are mentioned in the Sound of Music’s “My Favorite Things”). I already talked about strudel, so it is time to show schnitzel some lovin.’ And I love me some good schnitzel. Check out that chandelier. For realz, yo? And check out this link that explains how they make the schnitzel. It even has a picture of where the meat comes from on the pig. Now, lots of people make schnitzel in Austria. Duh. But it’s difficult to find a really nice schnitzel – it can be a bland and dry, despite the fact that it’s fried up and oily. Not great. But the schnitzel at Figlmuller is awesome. And serve with their traditional Austria potato salad (I MUST learn how to make this), and some Austrian coleslaw, this schnitzel will blow your mind. Plus, one schnitzel is big enough for two people. If you order it, make sure you ask for some currant jelly to go with it (it’s kinda like cranberry sauce – yum). Jealous? I am jealous of past Rachel that got to eat this and didn’t leave anything for future Rachel. Posted in Austria, Cooking, Food, Vienna and tagged Austria, Cooking, Food, Pork, Schnitzel, Vienna. Bookmark the permalink. I set out this summer to learn how to make yummy Austrian food. I bought an Austrian cookbook even. 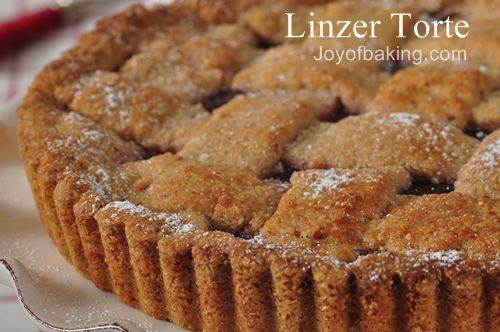 First on my list to make: Linzer Torte. A sweet, nutty pastry crust, almost a shortbread, holds a layer of tangy current jam, covered by a criss-cross of more pastry, sprinkled with sliced almonds and powdered sugar. Sounds good, no? Though I have not actually tried one, I know what sounds yummy when I hear it, so I figured that I am decent enough baker to undertake this task. Being that I am subletting an apartment for the summer, I forgot about all the loops that one must jump through when learning to bake in a foreign land. Do I have the correct pots? When can I buy ground almonds? How do I say ground almonds? What is the cooking temperature in Celcius? Is the oven I am using true to temperature, or is it off a little bit? Will the fact that I am making a pastry when it’s 90 degrees in my apartment with no air conditioning affect the outcome? I pondered these all quickly and threw caution to the wind. I mean, how hard could it be, right? It’s like a pie, and I have made about a million pies. No biggy. Boy was I wrong. Wrong. Wrong. Wrong. Wrong. Wrong. I couldn’t find ground almonds, so I figured I would hand chop mine until they were very fine. I got them pretty small, but never the same texture as buying ground. I didn’t let the dough chill enough because my refrigerator here was actually pretty spotty on the day. I swore that I had seen a 9 inch spring form pan in the apartment, but in reality, I had only seen the bottom portion of the spring form pan, but the sides were no where to be found. So I used an 11″ tart pan that had seen better days. I converted the degrees on the Internet, but this oven is an electric convection oven that is warmer/faster than my oven at home. I was sweating buckets (not into the dough, mind you). The dough wasn’t properly chilled. The pan was too big. The almonds were too course. This porridge is too hot! That porridge is too cold! Wait… wrong story. At least she tasted good. I doubt she tasted how real linzer torte is supposed to taste, but still, the butter, nuts and jam, it’s hard to go wrong. I know this picture is going to be all over Pinterest any minute now for being so lovely. They say it’s what’s on the inside that counts, right? Well, let this be a lesson to those 4 people who read my blog: sometimes even bloggers make mistakes. Shocking, I know. I still haven’t bought the correct pan, but when I do, I will try again. Maybe it will be better next time. Maybe I will redeem myself. And maybe not. I guess that’s part of life’s journey. Like how I turned this into some greater life lesson even though in reality it was me failing abysmally in the kitchen and throwing a small tantrum? Posted in Austria, Cake, Cooking, Dessert, Food, Uncategorized, Vienna and tagged Austria, Baking, Cake, Cooking, Dessert, desserts, Failure, Food, Linzer Torte, Vienna. Bookmark the permalink. Last Thursday was some Austria holiday. Don’t ask me what the holiday was. At any rate, I had the day off from German class, so I went with a friend to explore Vienna. We ended up at the Sisi Apartments, which is a lovely museum that shows the fine trappings of living at the seat of the Holy Roman Empire for 400 or so years. Yum. (I didn’t take this picture, but cannot figure out the original source). And the Sisi Museum is full of the most AMAZING porcelain collections. The flea markets are also full of incredible vintage porcelain sets. I would start collecting now, but it would break when I take it back to the States, and I am moving probably 2 times in the upcoming year. So it’s not logical and stuff. Le sigh. Or I guess in German it would be: Die Sigh. Or Das Sigh. I am not good with the gendered pronouns. In the royal family, it was important that all young men have a hobby. One of the Habsburgs (don’t ask me which one) was lacking in a hobby for a time, until he became interested in gardening and horticulture. Of course, he had lush, well-stocked gardens. And to go along with his interest, he had multiple sets of gorgeous porcelain dishes, each with a different hand painted bloom delicately gracing the smooth surface. Just incredible. Unfortunately, the China was all behind glass so it was difficult to photograph these lovelies. A center piece. Yeah. I know. FABULOUS! Vintage silver. Another thing I want to start collecting. I died. Hand painted birds and a lobster?!!?! Little butterflies. On the plates and in my tummy when I think about setting a table with this divine stuff. I am off to enjoy a lovely day sunning myself along the lush banks of the Danube. Posted in Austria, Decorating, Dinner Parties, Museums, Vienna and tagged Austria, Habsburgs, Museums, Porcelain, Table settings, Vienna. Bookmark the permalink. Gustav Klimt was kinda awesome. And the Klimt exhibit currently at the Leopold Museum, Klimt – Up Close and Personal, in Vienna is also kinda awesome. The courtyard at Museumsquartier, where the Leopold is located. The bright colorful things are benches/chairs/tables for people to sit and enjoy the scene. Stormy weather, but still an undeniably beautiful public space. Not only does the Leopold have some of Klimt’s most incredible paintings, but the curators managed to track down hundreds (HUNDREDS!) of post cards that Klimt scribbled, sometimes as many as ten per day, to his dear friend, Emilie. Most of his postcards are about the weather, or what he ate for a dinner, or just a few thoughts that popped into his head. They are essentially the pre- and during-WWII equivalent of text messages, and were a wonderful glimpse into thoughts running through Klimt’s head. Letter that Klimt wrote to his life-long friend, Emilie. I love his fascinating sketches and wonderfully eccentric handwriting. I makes me want to resume the lost of art of postcard-text messaging. Klimt was a man who painted without an underlying motive, without pushing some major theory. He often said he was more interested in painting beautiful things than conveying some bigger thematic meaning. He also had many cats, which wandered freely through his studio. Rumor has it that he told his students that cat paw prints and occasional urine on his sketches were not a problem – they were really improvements. It was unclear if he was joking or not, and despite hygiene problems, I love this lighthearted approach to painting beautiful things. Though he mocked his art, Klimt was a successful painter during his lifetime, and received large sums for his paintings. During the summer, Klimt only wore long Chinese-style dressing gowns, with nothing underneath. Secret-revealing time: That is BY FAR the best way to paint. In the buff, or semi-buff. If I had a long Chinese-style dressing gown, I would wear it to paint too. Klimt was one of the founders of the Secession movement, a group of influential painters trying to break out of more conventional art molds. This (below) is a lovely poster for the group, that I believe was drawn by Klimt, but right now I cannot really remember. I have so much more to tell, because I was incredibly moved by this exhibit. There is also more awesome stuff that was on exhibit at the Leopold Museum, but I think I will share that with you later. Anyway, I hope you enjoyed this post. I want to finish by saying that I was never moved by Klimt before – the most famous works that everyone knew didn’t really speak to me – but this exhibit left me screaming to get out my paints, dying to put his techniques on canvas. If you haven’t been to see it yet, and have a chance, I highly recommend it. And I recommend wearing long gowns commando-style. Posted in Art, Austria, Museums, Vienna and tagged Art, arts, Austria, gustav klimt, Klimt, lake attersee, Leopold Museum, Museums, Painting, postcard text, Travel, Vienna. Bookmark the permalink. Are you as excited as I am? I mean, I am pretty darned excited. But I did tell you all that I was coming, so you probably have been holding your breath – impatiently awaiting the first post from this amazing European city. You can exhale now. You were turning blue. I just arrived two days ago, so I haven’t done too much. And, for those who don’t know – I interned in Vienna two summers ago – so I already know the city fairly well and don’t feel overwhelmed to do touristy things immediately. In fact, a big part of the excitement for my return has been spending time with my friends who live in Austria. You know the first episode of Gossip Girl? The one where the whole Upper East Side is a-twitter with the return of Serena van der Woodsen, but the viewers haven’t seen her yet and don’t know much about her? There’s just a lot of suspense and quick cuts of people whispering Serena’s name and looking around? Don’t lie. You know what I’m talking about. Well, Charlotte, my good friend who lives in Vienna, with whom I am currently staying, told me that my return reminds her of that first Gossip Girl episode. Obviously, I am flattered. Though this is definitely overstating my relevance to much of anything at the Vienna International Center. But the analogy was too flattering and amusing not to share. 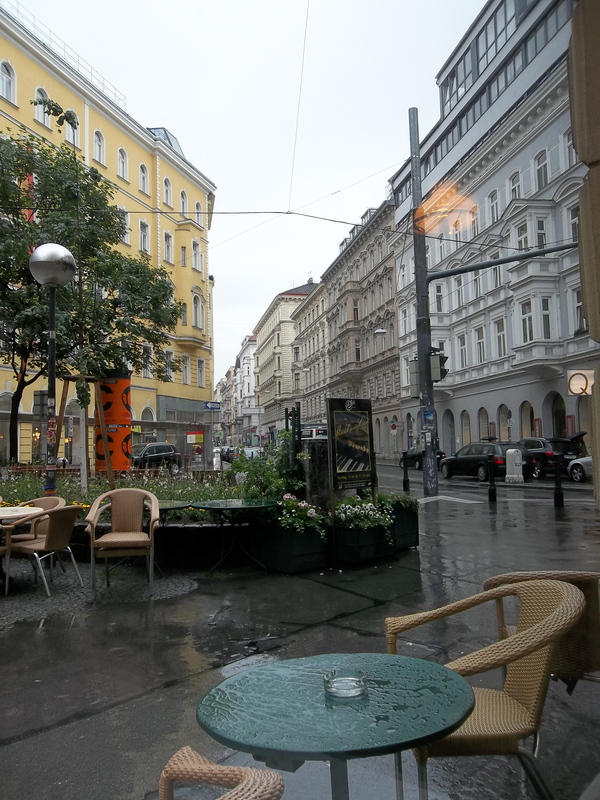 It’s been raining today, but even the rain, Vienna’s charm comes shining through. Vienna is famous for its coffee culture. Purchasing even one small cup of coffee is enough to allow you to sit for hours without being disturbed, watching the world go by (or doing your German homework, as the case may be). I ordered my usual melange – an espresso with foamed milk and cream. It comes on a darling tray with a sweet little glass of water. Of course, I went to Cafe Sperl. 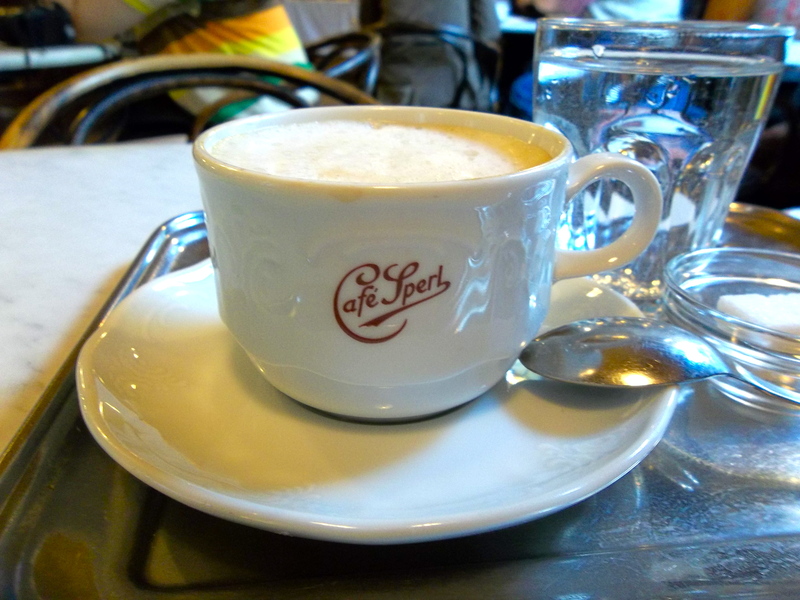 One of Vienna’s most renowned coffee houses, rumor has it that it was Hitler’s favorite. I felt very Viennese sitting in there, sipping a melange. Except for the fact that the place is a popular tourist destination. But we can ignore that. That were enough actual Austrians in the cafe to make up for it. 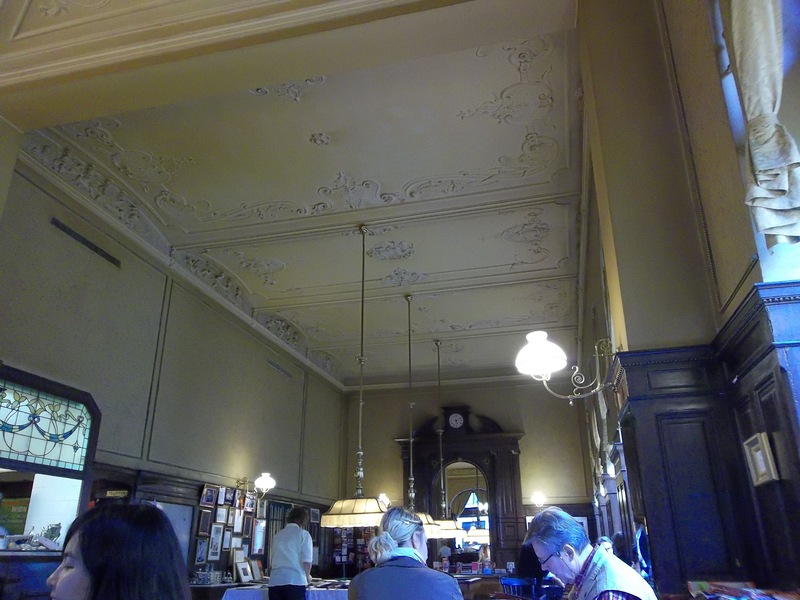 The Cafe Sperl decor has not changed for at least a century. High ornate ceilings hold epic hanging lamps that illuminate small marble tables below, while a few unsmiling (but not frowning) waitresses serve up coffees and pastries. As usual, my photos do not do it justice. I feel like Serena would have better photography, no? Oh, and one other thing. My birthday was a few days ago. I am officially in my late twenties now. More important than my age though, below is the sweet watch I received as a gift from my darling BF. I have been majorly coveting a two-toned watch. 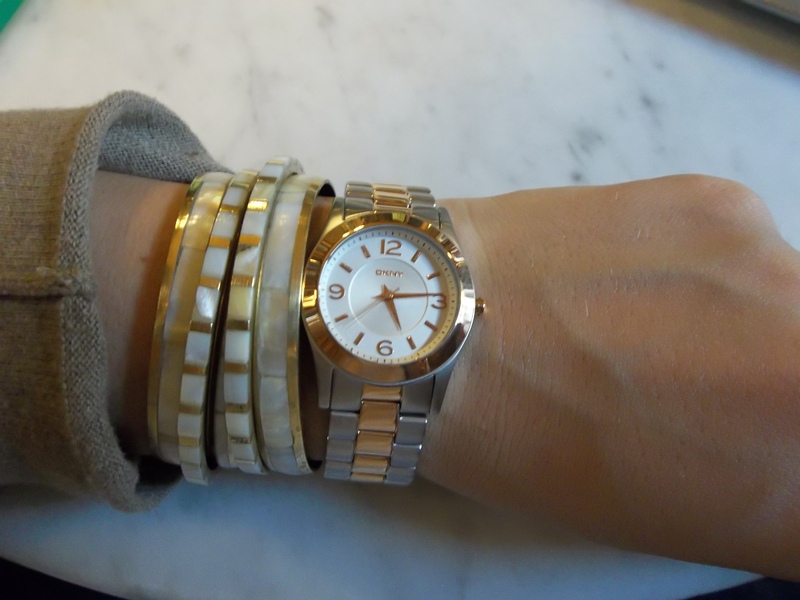 I wear a healthy combination of gold and silver jewelry (yes, healthy), so the watch will coordinate well. Plus, BF knows I love pink – so he deliberately selected Rose Gold, as opposed to normal gold. It’s really not that pink though – just has lovely pinkish undertones. Anyway, it’s late. I am jet-lagged. So I am off to bed. But, dear readers, I am on the look-out for some darling Austrian grandmother to teach me how to cook famous Austrian delicacies. So keep reading, and eventually some will pop up for sure. 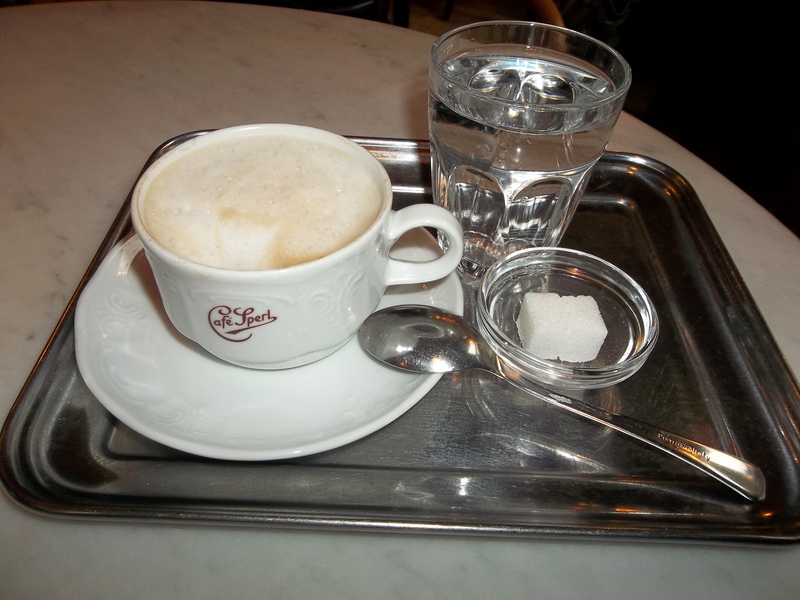 Posted in Food, Uncategorized and tagged Austria, Coffee, Coffee Houses, Food, Travel, Vienna. Bookmark the permalink.